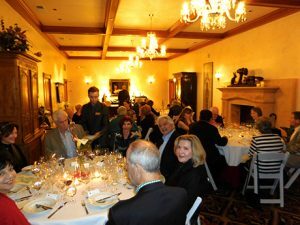 Saturday, March 18 was a beautiful winter evening in Napa Valley as members made their way to historic Chateau Montelena for a much anticipated evening of wine and food. 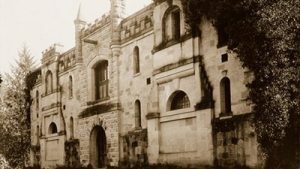 As Ron Fonolio has written in Wine, Food & Friends, Chateau Montelena was founded in 1882. 2017 is the 41st anniversary of “The 1976 Judgement at Paris” that stunned the wine world when white and red wines from Napa Valley were deemed to be the best in a tasting against top wines from Burgundy and Bordeaux. The winner in the white wine tasting was the 1973 Chateau Montelena Chardonnay. Chateau Montelena Continues to produce some of Napa Valley’s best wines and we were excited to experience an anniversary celebration in the Chateau’s beautiful Grand Room of the event that put Napa wines on the world wine map. Our evening began with a reception featuring Smoked Salmon, Goat Cheese, Creme Fraiche, Dill, Chives, Buckwheat Blini; Blueberry BBQ Pulled Duck Sliders, Blue Berries, Homemade BBQ, Radicchio & Endive Slaw, Sourdough Buns; served with 2012 Chateau Montelena Riesling, 2013 Zinfandel and 2008 Cabernet Sauvignon. Dinner followed starting with Lobster Ravioli, Blistered Cherry Tomatoes, Pancetta, Pea Shoots, Brown Butter, White Wine Reduction, Parmesan Cheese; served with 2013 Chateau Montelena Chardonnay. Our Entree was a choice of Wild Alaska Salmon or Herb Marinated Steak, whipped Potatoes, Haricots Verts, Sun Dried Tomatoes, Spicy Beurre Fondue paired with 2006 and 2009 Chateau Montelena Estate Cabernet Suavignon. And finally for dessert Pumpkin Spice Dots De Creme, Bourbon Vanilla Whipped Creme, Shaved Chocolate and Spiced Pecans. The winery staff did a great job of insuring our evening was a wonderful wine, food and friends experience.